Editor’s note: Andy Vale is a former content manager at Audiense. No matter the business, bold choices often come with big risks. And in television, where shows can easily cost millions to produce and audience reaction can be tough to predict, risk aversion is a high-stakes science. After a career filled with major writing credits (Cheers, The Jon Stewart Show, Late Night with David Letterman), and over four years as Twitter’s global head of TV, Fred Graver has turned his focus back to scriptwriting – now combining it with his long-time interest in technology. I caught up with him to see why he thinks social data holds a pivotal role in show creation, how you can use data for creativity, and how technology plays an integral part in his new show’s creative process. Vale: What sparked your interest in the connection between social data and TV? Graver: In the mid ’90s I became fascinated by the internet … I totally fell in love with it. I was working at Disney, and spent a lot of time researching the possibilities of the medium and how Disney could be prepared for its imminent expansion into our society. I then moved to MTV, where I assembled the team that built the first website for VH1 and achieved some other internet firsts in my role as SVP of digital content. Learning how TV channels could make the most out of the internet became an obsession. Fast forward to the present day. At Twitter, I saw tons of TV studios using Twitter data to analyze the performance of their shows and who they were connecting with. on me, why not use this data in the creation of the show too? So I wrote a show where I did just that. Vale: What can you tell us about the show? Graver: It’s a comedy set 40 years in the future. I’ve seen a lot of dystopian films or shows where computers have gained sentience, become evil, and taken over. I wondered what it would be like if they were as neurotic, erratic, insecure, and charmingly flawed as the people who made them: us. What’s that future like? What situations arise? How do these self-conscious robots deal with the emotional issues that we face every day? Vale: Why did you need to use Twitter data to make the show? Graver: In my original draft, I noticed it was skewing very strongly toward one demographic, and I wanted it to be relevant to a bigger audience. The characters I was creating needed to appeal to those people. But writing these varied characters is about more than just clothing or token references, you really need to know who they are on a more personal level. I wanted to explore new ways of building that understanding, and with Twitter being an open network I was familiar with, it was a natural choice. Vale: How do you use technology to assist? Graver: Firstly, I use our social analytics platform (Audiense) to identify an audience of 850,000 people that resembles the audience I am trying to appeal to. Next, I use a tool powered by IBM Watson, which is part of our analytics platform to get a rich depth of insight into their characteristics, needs, and values. I fed in certain sets of interests too, and it told me what the people who liked them were like. Vale: Why was this useful in the creation of the show? Graver: By analyzing different segments of our audience demographic, we were able to correct what turned out to be an over-indexing to one segment. It also gave me extra inspiration for some characters and their plot points, as well as confirming ideas I had for others. Moreover, this new way of creating a show will get a lot of interest from potential sponsors. Once you embrace your audience openly, you can bring in advertisers as you can clearly point to who your show is likely to appeal to with far greater accuracy. This is of great value to them, and thus it’s valuable for the studios too. Vale: At what stage is the show now? Graver: I’ve been working with the entertainment company Anonymous Content (Mr. Robot, The Revenant, Eternal Sunshine), which has totally embraced this concept of data intelligence in show creation. I handed in a final pilot and we’re now ready to go out and sell it. Vale: What are some specific examples of how you used the personality traits? Graver: One of my lead characters is a Latin-American woman who handles the U.S. database of computer networks, but I wanted to understand the audience to help write her accurately. We identified 850,000 people within this niche of Latino women interested in technology. Something we noticed was that although they were highly tech-savvy, they skewed towards being less impulsive and having more traditional values. Without giving too much away, this conflation helped us mold the plotline in the pilot of the show. Vale: How do we balance the relationship between creative-gut feeling and using data for good stories? Graver: Firstly, you’re always going to need good scriptwriters, showrunners, and actors to bring ideas to life. I don’t think robots armed with data are going to replace them any time soon. But here’s where it helps: I often sit and wonder how to write a show for audience X, and how the different segments of that audience would like it, or how to write a character from a certain background or culture. But I don’t always know what they’re really like or how to portray them accurately, and a focus group wouldn’t necessarily give me a broad, accurate picture. Vale: How does social data analysis differ from conducting focus groups with those audiences? Graver: There’s still room for that direct level of focused research, but they’ll only tell you what they know they want, and it can’t be done at scale. By analyzing the social data, you find invaluable things about them that they might not know themselves; we can see en masse what they like, what they respond to, what they value, what makes them laugh, and what their overall personality traits are. You can then use that understanding to inform your writing, and see if your interpretation of that data tallies with the audience in real life. Vale: Do you think senior executives in the entertainment industry are ready for this? Graver: Legendary Pictures uses data like this all the time, as does MGM because one of their investors is a big data guy. It’s growing, but there are some roadblocks, which is a shame because this approach removes a lot of big question marks. The problem is that there are still some executives in charge of the networks that got used to being gatekeepers, a holdover from a time when there was a limited amount of media to compete with. They understood a model for making television that worked in the past, and they’re cautious about deviating from it. Vale: Why do you think they should deviate from it if it worked in the past? Graver: There’s now an unlimited amount of media competing for our attention; anybody with a camera and an idea can make a TV show. It might be on YouTube, Twitter, or Snapchat rather than a traditional TV channel, but what’s the difference nowadays? It’s all competition for eyeballs. So in order to attract an audience you have to do extraordinary things, and really work hard to prove you’re valuable. You prove that value by listening to the audience, and showing the results of it in your work. Vale: What’s the relationship between the creators of TV shows and Twitter? Graver: It still has limitless potential. Both producers and showrunners I speak to are still really interested in using Twitter alongside their TV shows. Twitter is where the conversation takes place, and it offers new ways to build an audience. They’re looking at how to use other social networks too, and the best practice for each platform differs; but the overwhelming view is that for real-time engagement about the show, Twitter is still the second screen of choice. Vale: How are writers and producers using that conversation to shape their shows? Graver: I’ve talked with a lot of writers and producers about this. Many are already on Twitter, talking to the audience. They are comfortable with hearing how viewers are feeling. It’s like a third eye that looks at what viewers think about plot, characters, and episodes. To make it a truly useful feedback loop, the producers then have to ask, why is the audience REALLY saying that? Vale: How do TV producers understand the underlying reasons why an audience gives the feedback that they do? Graver: Answering that question is very much the craft of writing and producing something. It’s not a strict connect-the-dots process, and that’s why you’re still going to need top quality, creative talent. But to me, that process can be hugely assisted by analyzing the audience having those conversations using IBM Watson, and implementing your discoveries into the show’s creation. Using artificial intelligence to analyze audience psychology will tell you things about them at scale that they might not even know about themselves. Insights can inform creative strategy, as well as ensure that your marketing message matches the audience you want to reach. There’s more competition for attention than ever, placing a greater pressure on brands to know their audience to cut through the noise. Personality insights gleaned from artificial intelligence (such as IBM Watson) highlight which sections of an audience are more likely to respond to your campaigns in a certain manner. Audience data is an invaluable aid to creativity and insight, but it shouldn’t replace the innovative spark in your top talent. Let one power the other, and vice versa. Staying still is not an option; best practices and technologies that were sufficient in the past will become outdated. An eye needs to be kept on new marketing platforms and ways to use them. TV audiences are still highly active and vocal on Twitter, allowing for substantial audience research and building. Graver: Twitter has over 313 million active users, enough to build an accurate picture of any niches and audiences that a brand could wish to understand and reach. Sure, it’s got fewer users than some social networks, but for every brand looking to tap into its customers’ minds and add a layer of understanding, it’s invaluable. Why is that? Because the vast majority of tweets and connections are public. It’s open data that is out there for you to analyze. This provides marketers and insights professionals with the scope to look deep into what resonates with audiences, how they’re connected to the world, what type of devices they use, what characteristic traits they have, who influences them … the list goes on. Not only can you get all of this data to build useful insights to act upon, you can also see the individuals you’re analyzing to ensure that your original segmentation was accurate. This isn’t possible on closed networks, where there will always be an element of guesswork. The information gathered from Twitter audience research is an important building block in creating a full-bodied audience persona and deriving useful insights, which feed into other areas of the business. In the past, this information has been gathered on a sample basis through surveys and focus groups. It’s now available at the push of a button, at scale. This doesn’t just save businesses time and money, it guides their traditional research methods by pointing them in a strong direction from the start. A version of this article originally appeared in the June issue of Chief Content Officer. Sign up to receive your free subscription to our bimonthly, print magazine. Andy’s aim is to make B2B content that people enjoy reading. As senior copywriter and content manager at Infinity, a leading call intelligence platform, he works to tell stories and help digital professionals by making complex customer journeys understandable. 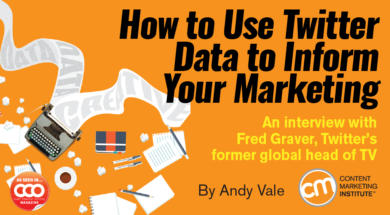 Find him chatting about business, culture, and life on Twitter @AndyVale.